http ://birsekermasali .com/css_files/gen/quote.exe (VirusTotal 25/66) (Payload Security)... This email attachment contains what appears to be a genuine word doc or Excel XLS spreadsheet with either a macro script or an embedded OLE object that when run will infect you... DO NOT follow the advice they give to enable macros or enable editing to see the content... 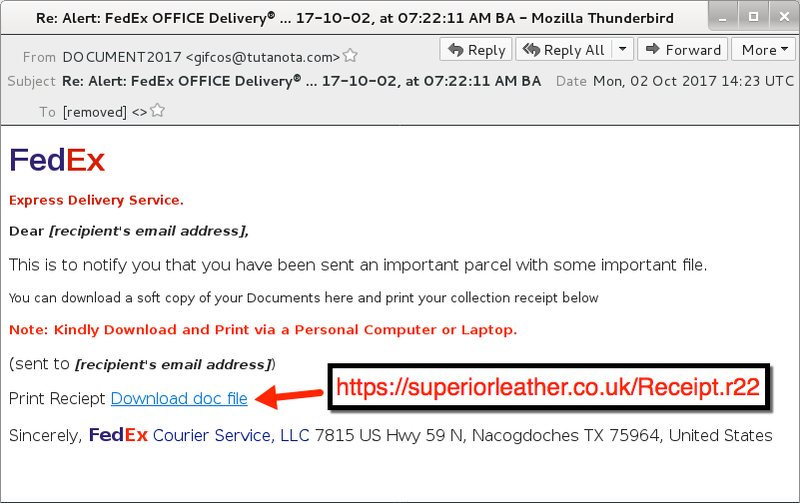 The basic rule is NEVER open any attachment to an email, unless you are expecting it..."
185.46.121.66  port 443 - superiorleather .co.uk - GET /Receipt.r22 ..."
198.54.114.238 port 80 - www .prfitvxnfe .info - POST /ch/ "
but there is also a RAR attachment with a file of the same name. It is highly likely that other versions of this email will have a different download link, that might be active. The basic rule is NEVER open any attachment -or- link in an email, unless you are expecting it..."
The basic rule is NEVER open any attachment to an email, unless you are expecting it..."
Edited by AplusWebMaster, 03 October 2017 - 02:08 PM. The basic rule is NEVER open any attachment or link in an email, unless you are expecting it..."
Edited by AplusWebMaster, 04 October 2017 - 01:18 PM. This email -attachment- contains a genuine word doc with a macro script that when run will infect you. ... DO NOT follow the advice they give to enable macros or enable editing to see the content... The basic rule is NEVER open any attachment to an email, unless you are expecting it..."
Edited by AplusWebMaster, 05 October 2017 - 04:40 AM. Edited by AplusWebMaster, 06 October 2017 - 07:58 AM. DO NOT follow the advice they give to enable macros or enable editing to see the content... The basic rule is NEVER open any attachment -or- link in an email, unless you are expecting it..."
... he encountered the -bogus- Flash download links on at least three subsequent visits. The picture above this post is the higher-resolution screenshot he captured during one visit... The file that got delivered when Abrams clicked through is called MediaDownloaderIron.exe. This VirusTotal entry* shows only Panda, Symantec, and Webroot detecting the file as adware. This separate malware analysis from Packet Security** shows the code is highly obfuscated and takes pains to conceal itself from reverse engineering. Malwarebytes flagged the centerbluray .info site as one that pushes malware, while both Eset and Avira provided similar malware warnings for one of the intermediate domains, newcyclevaults .com. In the hour this post was being reported and written, Abrams was unable to reproduce the -redirects- leading to the malicious download. It's possible Equifax has cleaned up its site. It's also possible the attackers have shut down for the night and have the ability to return at will to visit still worse misfortunes on visitors. Equifax representatives didn't respond to an e-mail that included a link to the video and sought comment for this post." 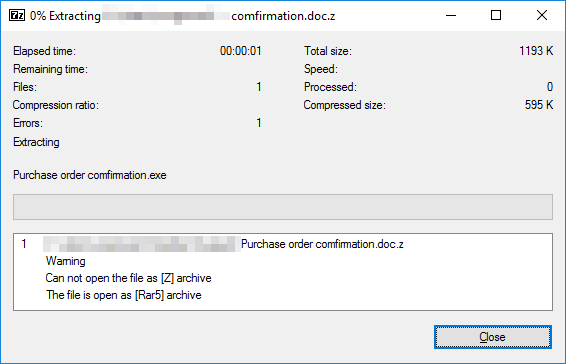 http ://analab .it/TransactionQuery_10-16-2017.zip which is actually a .rar file that needs to be renamed to .rar to extract it. TransactionQuery_10-16-2017.jar (307kb) - Current Virus total detections 19/58*. Payload Security**... The basic rule is NEVER open any attachment or link in an email, unless you are expecting it..."
Edited by AplusWebMaster, 17 October 2017 - 02:41 PM. 17 Oct 2017 - "... Beware of strangers offering fake invoices..."
Current Virus total detections 10/56. Payload Security | JoeSandbox. ... The basic rule is NEVER open any attachment to an email, unless you are expecting it..."
Edited by AplusWebMaster, 18 October 2017 - 01:50 PM. http ://alexandradickman .com/KJHDhbje71 where a base64 encoded file is opened and decoded. (VirusTotal 6/65) (Payload Security)... The basic rule is NEVER open any attachment to an email, unless you are expecting it..."
This email attachment contains a genuine word doc with a macro script that when run will infect you. - Fraudulent emails that involve monetary transactions such as bills, parcel/delivery confirmations, and payment receipts..."
Edited by AplusWebMaster, 19 October 2017 - 08:58 AM. "DO NOT follow the advice they give to enable macros or enable editing to see the content. The basic rule is NEVER open any attachment -or- link in an email, unless you are expecting it." 2017-10-19 - "... the DDE attack* technique has spread to large-scale distribution campaigns..."
DHS assesses this activity as a multi-stage intrusion campaign by threat actors targeting low security and small networks to gain access and move laterally to networks of major, high value asset owners within the energy sector. Based on malware analysis and observed IOCs, DHS has confidence that this campaign is still ongoing, and threat actors are actively pursuing their ultimate objectives over a long-term campaign. The intent of this product is to educate network defenders and enable them to identify and reduce exposure to malicious activity..."
Edited by AplusWebMaster, 21 October 2017 - 06:08 AM. office_security_update.zip: Extracts to: ms_office_update.exe - Current Virus total detections 13/67*. Update: after digging around the mail server quarantine, I have found several of these, coming via numerous different -compromised- email accounts. All of them have the same malformed content with no accessible attachment... The basic rule is NEVER open any attachment or link in an email, unless you are expecting it..."
Edited by AplusWebMaster, 23 October 2017 - 04:43 AM. Oct 24, 2017 - "A new ransomware strain named 'Bad Rabbit' is wreaking havoc in many Eastern European countries, affecting both government agencies and private businesses alike. At the time of writing, the ransomware has hit countries such as Russia, Ukraine, Bulgaria, and Turkey. The speed with which Bad Rabbit spread is similar to the WannaCry and NotPetya outbreaks... ESET and Proofpoint researchers say Bad Rabbit has initially spread via -fake- Flash update packages, but the ransomware also appears to come with tools that help it move laterally inside a network, which may explain why it spread so quickly across several organizations in such a small time..."
... many of the intermediate stages and files never get stored or kept on the victim’s computer, in fact the final Locky binary is deleted as soon as it has been run, so there are few forensic artefacts for investigation. Brad Duncan has done a Blog post at ISC explaining all this in detail with examples from the earlier run. where if the response is acceptable it then downloads the Locky ransomware file from that site in an encrypted text format and converts it to a working .exe. 6213Lq3p.exe (VirusTotal 8/67). ... if you are -not- interested in sending traffic to Iran, Mizban Web Paytakht own AS64428 which comprises of 185.165.40.0/22 as well. I'll make a guess that the 188.165.162.200/29 range may be -insecure- and could be worth blocking... You probably -don't- need to accept .z attachments at your mail perimeter, and any decent anti-spam tool should be able to look inside archives to determine was is in there." Edited by AplusWebMaster, 25 October 2017 - 05:47 AM. Current Virus total detections 1/62*. Payload Security**... system.air-alicante .eu looks to be a compromised Virtual Airline Site that appears to have been abandoned by its owner after a server crash. It was registered by Godaddy in July 2016 to a German Registrant. Currently hosted on 206.214.223.170 ServInt AS25847 which appears to be “owned” by a reseller fivedev .net who doesn’t have any abuse or contact details... The basic rule is NEVER open any attachment or link in an email, unless you are expecting it..."
PAYMENT.ace (VirusTotal 10/59*): Extracts to: PAYMENT.exe Current Virus total detections 28/67**. Payload Security... The basic rule is NEVER open any attachment to an email, unless you are expecting it..."
Payload Security** | Dridex Payload VirusTotal 13/67| Payload Security... The basic rule is NEVER open any attachment or link in an email, unless you are expecting it..."
Edited by AplusWebMaster, 25 October 2017 - 02:12 PM. - Current Virus total detections 29/66**. Payload Security***... The basic rule is NEVER open any attachment to an email, unless you are expecting it..."
Today’s example of the spoofed domain is, as usual, registered via Godaddy as registrar using privacy protection services. Edited by AplusWebMaster, 26 October 2017 - 08:45 AM. ... Using a UK based IP number, this delivered requ4.exe which is an old well known remote admin tool Netcat. (VirusTotal 48/67)... using a USA based IP via a proxy, I also got requ4.exe (from the same urls) but a totally different version that looks like Locky ransomware (VirusTotal 15/66) (Payload Security)... DO NOT follow the advice they give to enable macros or enable editing to see the content... The basic rule is NEVER open any attachment to an email, unless you are expecting it..."
Edited by AplusWebMaster, 31 October 2017 - 09:31 AM. Having a sound, layered, defense-in-depth strategy in place will help ensure that organizations can respond to the constantly changing threat landscape. Users, however, must also remain vigilant and think twice before clicking-a-link, opening-an-attachment or even blindly trusting the results of a Google search..."
These threats highlight how even mobile devices can be used for cryptocurrency mining activities, even if, in practice, the effort results in an insignificant amount of profit. Users should take note of -any- performance degradation on their devices after installing an app. We have reached out to Google, and the apps mentioned in this post are no longer on Google Play..."
"... Conclusion: Fileless attacks are becoming more common. Threat actors are increasingly using attack methods that work directly from memory and use legitimate tools or services*. In this case, WMI subscriptions have been used by this cryptocurrency-mining malware as its -fileless- persistence mechanism. Since there are no malware files on the hard drive, it’s more difficult to detect..."
Edited by AplusWebMaster, 03 November 2017 - 10:51 AM. This delivers wera4.exe (VirusTotal 10/66) (Payload Security)... The basic rule is NEVER open any attachment to an email, unless you are expecting it..."
Today’s example of the spoofed domains are, as usual, registered via Godaddy as registrar. DO NOT follow the advice they give to enable macros or enable editing to see the content... The basic rule is NEVER open any attachment to an email, unless you are expecting it..."
Edited by AplusWebMaster, 07 November 2017 - 06:24 AM. faxmessage*** .ml is being hosted on different IP numbers & ranges all appearing to be -compromised- ISP IP numbers from major ISPs in UK, Europe & USA. In previous phishing and malware scams by this criminal gang they used a range of domain numbers between 1 and 600 over several days, so there could be a lot more to come. ... DO NOT follow the advice they give to enable macros or enable editing to see the content..."
Edited by AplusWebMaster, 08 November 2017 - 03:34 PM. ... Watch for -any- site that invites you to enter ANY personal or financial information... All of these emails use Social engineering tricks to persuade you to open the attachments that come with the email... Email Headers and phishing Site information: the From address in the email does-not-exist and is totally made up..."
Edited by AplusWebMaster, 10 November 2017 - 01:28 PM. 13 Nov 2017 - "An email with the subject of 'Important: Outdated Invoice' pretending to come from Sage but actually coming from a look-a-like or typo-squatted domain <secure@ sage-invoices .com> with a malicious word doc attachment... delivering Trickbot banking Trojan... Today’s example of the spoofed domains are, as usual, registered via Godaddy as registrar. Edited by AplusWebMaster, 13 November 2017 - 07:56 AM. Despite the instructions in the email to use the Authorisation code in the word doc, there is nowhere to enter it and it is not needed. The criminals are relying on you being fooled by this simple Social Engineering trick persuading you to enable Macros and content to infect you & steal your Money, Passwords and Bank details. Today’s example of the -spoofed- domains are, as usual, registered via Godaddy as registrar. free.hostsailor .com AS60117 Host Sailor Ltd.
lloydsbankdocs .com hosted on and sending emails via 134.19.180.151 134191801511.onlinemarketmix .com AS49453 Global Layer B.V.
http ://simplicitybystrasser .com/images/logo.png which of course is -not- an image file but a renamed .exe file that gets renamed to a .exe file. (VirusTotal 9/68***). DO NOT follow the advice they give to enable macros or enable editing to see the content..."
Has a malware prompt on its home page, luckily the file is hosted-on-Dropbox & no longer available for download. Edited by AplusWebMaster, 14 November 2017 - 09:07 AM. banklinemail .com hosted on 160.153.129.238 Godaddy AS26496 but also sending emails via 185.106.121.234 | 95.211.104.113 | 46.21.144.11 | 134.19.180.163 | all of which pass authentication and have correct records set. Despite the instructions in the email to use the Authorisation code in the word doc, there is nowhere to enter it and it is not needed. The criminals are relying on you being fooled by this simple Social Engineering trick persuading you to 'enable Macros' and content to infect you & steal your Money, Passwords and Bank details. They tell you Note: Contents of this document are protected and secured. If you have problems viewing/loading secure content, please select “Enable Content” button. Do NOT enable Macros or Content under any circumstances. That will infect you. 8d6ba737-775e8bdc-f95f16f3-1b460259.doc - Current Virus total detections 2/59*. 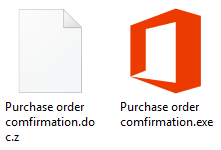 Payload Security**..
http ://aperhu .com/ser111517.png which of course is -not- an image file but a renamed .exe file that gets renamed to tdhq.exe (VirusTotal 11/59***). this QR scanner is short lived. You only get one chance to use the app, because after clicking out of it, the icon disappears! Out of frustration, you may immediately go to your apps list to uninstall this bizarre-behaving QR scanner, but good luck finding it... there appears to be no fail-proof way to stop malware from entering the Play store. This is where a second layer of protection is strongly recommended. By using a quality mobile anti-malware scanner, you can stay safe even when Google Play Protect fails..."
Nov 16, 2017 - "Google has removed from Google Play eight apps that have served as downloaders for Android banking malware..."
Edited by AplusWebMaster, 16 November 2017 - 07:40 AM. -both- of which fail to respond. Both sites are hosted on Godaddy (184.168.221.53) and have a temporary holding / domain parking page with the usual adverts. Both sites were registered in early September 2017. Either Godaddy has exploitable vulnerabilities on their Domain Parking pages or they were registered by criminals who haven’t set up the domains properly yet. No relevant DNS requests were made. http ://simplicitybystrasser .com/images/ser.png which of course is -not- an image file but a renamed .exe file that gets renamed to Aqv6.exe (VirusTotal 10/68***). Edited by AplusWebMaster, 16 November 2017 - 11:03 AM. These are actually coming via an automated mailing service based in Russia, who despite sending malware are complying with the various anti-spam laws worldwide by having an unsubscribe link in the email body. I do not recommend to use the -unsubscribe- link. That is an almost guaranteed way to get your email address added to a load more spam and malware lists. The blurry image in the XLS spreadsheet is a Social Engineering trick to persuade you to enable editing & content (macros) so they can infect you. http ://n224ezvhg4sgyamb .onion/sup .php where you see a pretty bland page giving this link to make enquiries... The basic rule is NEVER open any attachment to an email, unless you are expecting it..."
... Mitigation: This type of 'pop-under' is designed to bypass adblockers and is a lot harder to identify because of how cleverly it hides itself. Closing the browser using the “X” is no longer sufficient. The more technical users will want to run Task Manager* to ensure there is no remnant running browser processes and terminate them. ... Nearly two months since Coinhive’s inception, browser-based cryptomining remains highly popular, but for all the wrong reasons. Forced mining (no opt-in) is a bad practice, and any tricks like the one detailed in this blog are only going to erode any confidence some might have had in mining as an ad replacement. History shows us that trying to get rid of ads failed before, but only time will tell if this will be any different. Unscrupulous website owners and miscreants alike will no doubt continue to seek ways to deliver drive-by mining, and users will try to fight back by downloading more adblockers, extensions, and other tools to protect themselves. 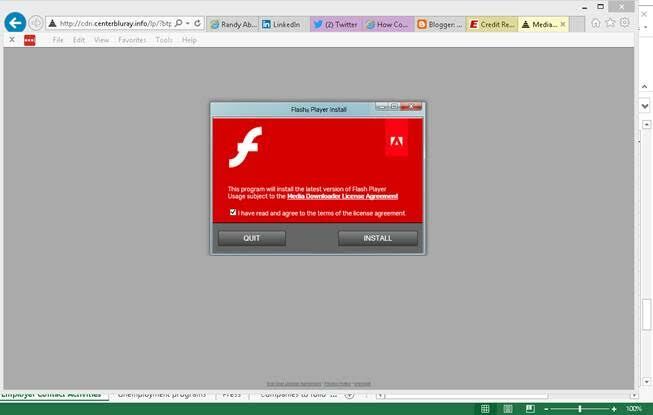 If malvertising wasn’t bad enough as is, now it has a new weapon that works on all platforms and browsers." Edited by AplusWebMaster, 01 December 2017 - 06:36 AM. ... DO NOT follow the advice they give to enable macros or enable editing to see the content... Do NOT enable Macros or editing under any circumstances... The basic rule is NEVER open any attachment to an email, unless you are expecting it..."
Edited by AplusWebMaster, 01 December 2017 - 07:38 AM. ... They successfully extended and expanded sinkholing of the -21- malware families that made use of the Avalanche platform, and the associated takedown of the -Andromeda-botnet- is another great example of how complex international operations can successfully be jointly executed by a combination of cross-disciplinary public and private partners in the ongoing fight against cyber criminals globally." Dec 1, 2017 - "... The operation involves arrests and searches in five countries. More than -50- Avalanche servers worldwide were taken offline..."
... Whatever your particular spending circumstance, wean yourself away from clicking on -any- email-link where claims of payment or requests for personal information are concerned. Take a few seconds to manually navigate to the website in question. and log in directly instead. If there are any payment hiccups happening behind the scenes, you can sort things out from there. Scammers are banking on the holiday rush combined with the convenience of “click link, do thing” to steal cash out from under your nose..."
Edited by AplusWebMaster, 04 December 2017 - 02:57 PM. Edited by AplusWebMaster, 05 December 2017 - 06:46 AM. http ://undergroundis .com/images/logo.png which of course is -not- an image file but a renamed .exe file that gets renamed to Wkob.exe (VirusTotal 13/67***)... DO NOT follow the advice they give to enable macros or enable editing to see the content..."
Google update 'glitch' disconnects student Chromebooks in schools across the U.S.
Dec 5, 2017 at 4:59 pm - "... Tens of thousands, perhaps millions, of Google Chromebooks, widely prized by schools due to their low cost and ease of configuration, were reported to be offline for several hours on Tuesday. The apparent cause? A seemingly -botched- WiFi policy update pushed out by Google that caused many Chromebooks to forget their approved network connection, leaving students disconnected. Google first gave schools a heads-up via Twitter after the fact, indicating there was a fix. 'We're aware of a wifi connectivity outage that affected some Chromebooks today. The issue is resolved. To get your Chromebooks online: reboot & manually join a WiFi network or connect via ethernet to receive a policy update. Sorry for the disruption & thank you for your patience. That disclosure led to dismayed reaction by educators, some of whom had Chromebook installations in the thousands... GeekWire reached out to Google for more information about the cause and scope of the Chromebook issue, and will update this post if more details become available." Edited by AplusWebMaster, 06 December 2017 - 02:36 PM. Edited by AplusWebMaster, 07 December 2017 - 08:38 AM. There will be loads of other download sites... DO NOT follow the advice they give to enable macros or enable editing to see the content..."
If you are unwise enough to ring the number you will be falsely told that there is something wrong with your computer. 'It needs cleaning'... and it will cost you at least one hundred USD to repair. The IP address registered on your name was referred to our ICC Center multiple times as being a possible victim of cyber crime. We believe that your IP address and other identifying information were used to commit several computer fraud and abuse crimes. This investigation covers the time period from August 7, 2017 to the present date. We appreciate your instant assistance to this matter. Please contact us urgently with all of the information concerning this case, at telephone number listed below... "
"As of December 15, 2017, AOL Instant Messenger products and services will be shut down and will no longer work. If you are an AOL member, AOL products and services​ ​like AO​​L Mail, AOL Desktop Gold an​d Member​ Subscriptions will not be affected.​ To view your benefits, please visit: https://mybenefits.aol.com/ "
Edited by AplusWebMaster, 15 December 2017 - 10:06 AM. Dec 19, 2017 - "... Some clever researchers have found new and unexpected ways to get Word, Excel and PowerPoint documents to deliver all sorts of malware — ransomware, snoopers, even a newly discovered credential stealer that specializes in gathering usernames and passwords. In many cases, these new uses employ methods as old as the hills. But the old warning signs don’t work as well as they once did..."
Edited by AplusWebMaster, 20 December 2017 - 08:21 AM. We’ve identified certain vendor files that may contain XSS vulnerabilities which could pose a security risk. Please check if you are hosting these files and remove them with the help of your webmaster. These are the currently identified third-party vendor files...'"
Dec 19, 2017 - "As cryptocurrencies continue to increase in value, cryptomining becomes increasingly more lucrative. With Bitcoin nearly reaching $18,000USD/1BTC, speculation that other cryptocurrencies such as Etherium and Monero may hit this mark eventually is rising. Monero is especially interesting given that one of its primary advantages is the relatively low processing power needed to mine it. Given that it is capable of being mined even by consumer grade computers, many organizations have tried to capitalize on this facet of the currency. It’s impossible to say with accuracy where the future will take cryptocurrencies or cryptominers, but they’re almost certainly here to stay. As the internet continues to evolve in its third decade of existence, enterprising individuals will always be looking for the next motherlode, taking advantage of a landscape that others can’t see." Edited by AplusWebMaster, 21 December 2017 - 09:50 AM. http ://www.upperlensmagazine .com/tOldHSYW? ?DVTCGAtym=DVTCGAtym (VirusTotal 11/68). As usual there will be 6 or 8 other download sites... The basic rule is NEVER open any attachment to an email, unless you are expecting it..."
Edited by AplusWebMaster, 22 December 2017 - 06:35 AM. "... The basic rule is NEVER open any attachment to an email, unless you are expecting it..."
Once attackers get in, they install a Monero miner, and they also use the infected site to carry out further brute-force attacks. These two operations don't happen at the same time, and each site is either brute-forcing other WordPress sites or mining Monero..."
Dec 18, 2017 - "A massive distributed brute force attack campaign targeting WordPress sites started this morning at 3am Universal Time, 7pm Pacific Time. The attack is broad in that it uses a large number of attacking IPs, and is also deep in that each IP is generating a huge number of attacks. This is the most aggressive campaign we have seen to date, peaking at over 14 million attacks per hour. The attack campaign was so severe that we had to scale up our logging infrastructure to cope with the volume when it kicked off, which makes it clear that this is the highest volume attack that we have seen in Wordfence history, since 2012..."
Edited by AplusWebMaster, 26 December 2017 - 02:15 PM. "Apple apologizes for iPhone slowdowns and offers $29 battery replacements..."
Dec 28, 2017 - "... Apple Inc (AAPL.O) is slashing prices for battery replacements and will change its software to show users whether their phone battery is good..."
Early in 2018, we will issue an iOS software update with new features that give users more visibility into the health of their iPhone’s battery, so they can see for themselves if its condition is affecting performance..."
Edited by AplusWebMaster, 29 December 2017 - 06:29 AM. 17 Jan 2017 - ".... an aggressive phishing campaign against Bank of America arriving overnight UK time. They all pretend to come from Bank of America < BankofAmerica@ customerloyalty.accounts.com > but are actually coming from various servers. I have posted details of 2 that I received. The emails are identical apart for the subject line. There will almost certainly be other similar subjects that I haven’t seen yet. All of these emails use Social engineering tricks to persuade you to open-the-attachments that come with the email..."
I contacted the IRS about the unsolicited call from the scammer who left the threatening message. The IRS representative said that, despite warnings, people still readily give out personal data and fall into the traps of these scammers. To that point, the Treasury Inspector General for Tax Administration reports that more than 10,000 victims have collectively paid in excess of $54 million as a result of phone scams since October 2013. So while it may seem obvious, here goes: Never, ever give out personal financial information — such as Social Security numbers or credit card and bank account numbers and passwords — to anyone who calls you, claiming to be from the IRS..."
Edited by AplusWebMaster, 26 February 2018 - 03:48 PM.